History: This 54-year-old otherwise healthy Caucasian male had 5 prior hair transplants to his scalp as well as 3 scalp reductions in his crown. His last procedure was 18 years ago. His concerns are that his hairline and transplanted hairs appear unnatural, that he lacks overall density for any hairstyling option, and that the scar from scalp reduction in his crown is visible. He is compelled to cut his hair short in order to make his unnatural hair look less obvious. Of note, he has been taking finasteride 5 mg for the past 3 years for an enlarged prostate but has not observed any significant hair regrowth during that time. Physical Examination: This patient exhibits a Norwood 5A pattern with grafts placed into his hairline, central midscalp, and the scar in his crown. Due to his hair loss progression, his native (non-transplanted) hairs gradually were lost to expose only his remaining transplanted grafts. He now exhibits hair loss in the fronto-temporal region, upper portion of the lateral humps, in the midscalp, and with extension into the vertex/crown region. 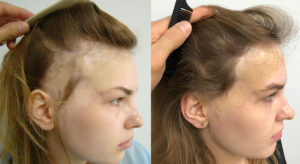 He shows large plug grafts placed densely and at a perpendicular angle to the scalp in an unnatural U-shaped hairline. His transplanted area looks unnatural and is difficult to style. In addition, his crown reveals a vertical scar and a slot deformity. His occipital region is covered with multiple linear scars along with “gunshot” plug scars, but he has a virgin donor area that extends around the upper occipital and lateral hump (upper parietal) region. His hair density is high, of medium quality, straight, and white in color. His skin is medium color and exhibits medium elasticity. He has medium beard hair density that is also white in color. Plan: The plan for this gentleman is to harvest approximately a 1,000 strip (FUT) grafts and approximately 500 beard FUE grafts. A donor strip of tissue would be harvested in the upper portion of his occipital area following a minimum of 6 weeks of scalp stretching exercises to ensure maximal wound pliability. Also beard hairs below his chin would be harvested at the same time and placed throughout the midscalp and crown. The first goal is to de-emphasize the front heavy and pluggy appearance of his hairline without changing its position by grafting scalp grafts principally behind the hairline to soften the appearance. The second goal is to cover the exposed scalp in the midscalp and the scar in the crown so as to provide a more uniform scalp coverage by using a combination of scalp and beard hair. Finally, the third goal is to place a few scalp grafts into the temporal area and temporal points to create a more balanced anterior hairline frame. Procedure: The patient underwent a strip harvest that extended from his upper parietal regions and upper occipital donor region centrally of 26 cm in length by 8 mm in width that yielded 1,561 grafts for a total of 4,070 hairs. He had minimal tension on closure. He also underwent a beard harvest using a Cole Vortex 1.0 mm sharp punch to yield 555 grafts. The recipient area was prepared with platlet-rich plasma (PRP) mixed with 100 mg of fine powder ACell. Grafts were stored in HypoThermosol solution and liposomal ATP (10:1 ratio) and then a mixture of PRP/ACell was added immediately prior to graft placement. The scalp hairs were used to rebuild the temporal points, hairline, and central scalp density with the majority of grafts used to offset the frontal heavy appearance of the hairline by placing grafts into the midscalp region. The beard hairs were used mainly to rebuild the crown region and a small percentage were placed in a stick-in-place fashion to fill in residual gaps in the central midscalp at the end of the case. The attention was given to use soft scalp hairs in the exposed areas such as the hairline and to use beard hairs as a filler. The beard hairs would provide density but not be placed in one isolated area but interspersed among other grafts. The patient sprayed his grafts with ATP for the first 5 postoperative days every hour for the first 48 hours and then only during the day until he finished his supply of ATP spray. Results: The patient is shown before and 10 months following a single hair transplant session in which his hairline appears significantly more natural and balanced to his central and posterior midscalp. He also has almost complete coverage of his crown and camouflage of the slot deformity in the crown. Discussion: This case study poses the interesting problem of trying to correct a host of problems with a limited donor hair remaining for this patient. Considering the many procedures he had in the past, the biggest challenge was finding sufficient hairs to address all areas of concern. Although his donor area was covered with scars, the upper portion of the occipital rim showed virgin scalp with high hair density. Considering his age and that he is on medical management, I felt comfortable removing a narrow strip of donor tissue because I wanted to transplant scalp hair into his frontal and temporal hairline (as opposed to using beard hair which has coarse texture and would make his hairs look even more unnatural). Of note, he had consulted with other surgeons who turned him down and felt there was no hope to correct his problem. When approaching such a complex situation, it is important to determine priorities and to try to ensure getting a patient to as close to natural as possible in a single session. First, I addressed the hairline. I filled his fronto-temporal gaps and created small temporal points in order to make his hairline uniform and his frontal and temporal hairline balanced. Usually with large hair plugs, the strategy would be to remove plugs or to camouflage them with a significant number of smaller grafts placed in the front of the plugs. Instead, I decided to place the majority of grafts behind the hairline to most effectively use the grafts in his favor for a few reasons: 1) his central forelock and posterior midscalp were weak making the thickness and plugginess of the hairline more apparent. Adding density behind the hairline would block the light from reaching the scalp and the exposed transplanted hairs 2) the frontal heavy appearance of the grafted hairline would have been exacerbated if additional grafts were placed in front of it. 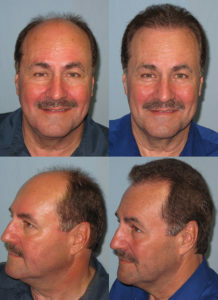 3) leaving larger grafts in the hairline was acceptable because his white hair made these grafts not look as unnatural as darker hair would 4) he truly needed a lot of grafts to fill all the gaps and make his hair look more natural and balanced and he had limited number of grafts to accomplish this task and grafts needed to be used wisely. Of note, only 115 grafts were used to recreate both temporal point/temporal hairline. When the frontal hairline is very forward positioned and the temporal hairline is receded, the hairline looks unbalanced and accordingly unnatural. This result shows how a very limited number of hair grafts placed strategically in the temporal region can already create a much more natural outcome without even touching the frontal hairline. As mentioned, the majority of 2- and 3-hair grafts were placed behind the existing hairline to create a central forelock and offset the U-shaped ring of hairs that contributed to his deformity. This is a great lesson for beginning surgeons who place too many grafts in a hairline without addressing the central density only to encounter 20 years later that the result becomes unnatural while there are no more grafts left to fix the problem. Finally, I addressed the crown. A slot deformity is caused by scalp reductions. Scalp reductions were procedures popularly performed in the 1990s that could at times leave a linear slot, i.e., distortion of hair direction and a linear hair-loss pattern, both of which are unnatural. Without enough scalp hairs to fully cover the crown and correct this patient’s problem, I turned to beard hairs as a supplemental donor source. Beard hairs have pros and cons. They are mainly 1-hair grafts (albeit at times they can mainly be 2-hair grafts in some individuals), so they may lack density in comparison to 2- and 3-hair grafts obtained from scalp. However, they typically tend to be a thicker diameter than most scalp 1-hair grafts so they can positively contribute to visual density but would not look natural in the hairline. Beard hairs are not as smooth as scalp hairs, so they serve as great fillers but cannot be placed in a localized, exposed fashion. Consequently, to make them blend better with other hairs, the beard hairs were also placed into the midscalp. Because his crown had already been narrowed by previous scalp reductions, a fewer number of grafts was sufficient to make the difference to cover the deformity. It was imperative to design the recipient sites in a radial fashion to mimic crown hair in a natural way and to overcome the unnatural compression of the patient’s whorl due to prior scalp reductions. Because the patient had potentially poor blood supply from so many prior hair transplant surgeries and scalp reductions, it was important to preserve blood supply and to improve graft survival by multiple methods to ensure that the result would be optimized and complications, minimized. Donor harvesting was undertaken very slowly and methodically, as per routine, to minimize risk of injury to the any of the deeper structures. Wound laxity was tested by harvesting a small segment of tissue and ensuring the wound be closed easily and tension-free before progressing. In the past 5 years, I have come to firmly believe that regenerative techniques like PRP, ACell, HypoThermosol, and ATP have become instrumental to optimize graft survival apart from excellent graft handling and preparation. Finally, this case demonstrates how a combination of both FUT (strip harvesting) and FUE can be used simultaneously for optimal results in this patient.